The parathyroid glands are oval structures the size of millet seeds, weighing around 30 mgs each.There is now a view that the normal weight of a single parathyroid may be as great as 100 mgs. There are usually four parathyroids and they lie on the posterior surface (the back) of the thyroid gland. Normally they are symmetrically arranged with the two superior (higher) parathyroids lying about 1cm above the point where the inferior thyroid artery enters the thyroid. The two inferior (lower) parathyroids lie 1cm below this point. There is variation in the number and location of glands. 5% of people have more than four glands. Superior parathyroids are more rarely abnormally positioned than inferior glands, but cases have been reported of superior parathyroids at the level of the thyroid cartilage and even at the level of the hyoid bone. Inferior parathyroids have been found as low as the level of the inferior pole of the thyroid and at the level of the manubrium (the top of the breast bone) and even in the chest. 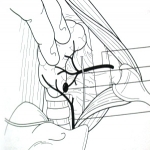 The glands can be either within the fibrous capsule of the thyroid (intracapsular), or outside it (extracapsular). This assumes great importance in surgery as tumorous intracapsular parathyroids will expand locally within the thyroid capsule. Extracapsular parathyroids are not constrained and may expand downwards into the mediastinum either anteriorly or posteriorly. Branches of the inferior thyroid artery supply the parathyroids. Great variation exists, supply by the superior thyroid arteries, the thyroid ima artery, the laryngeal arteries, tracheal arteries or oesophageal arteries has been documented. 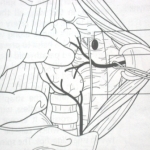 The glands drain into the plexus of veins on the anterior surface (front) of the thyroid comprising the superior, middle and inferior thyroid veins. 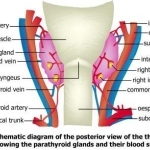 The parathyroids are supplied by thyroid branches of the cervical sympathetic ganglia with a mainly sensory function, detecting stretch within the glands that gives rise to the sensation of pain in some disorders. The superior parathyroids are derived from the fourth branchial pouches and the inferior parathyroids from the third branchial pouches. The process begins around the fifth or sixth week of development. The inferior glands actually start life above the superior glands but descend below them. This process of descent, during which time there is scope for error, accounts for the fact that the inferior parathyroids have more varied positions than the superior parathyroids. 1. Chief cells - these are the cells which secrete the parathyroid hormone (PTH). 2. Oxyphil cells - these have a secretory function but their precise role is not clear. 3. Adipose tissue - these are fat cells which add bulk to the glands. 4. Fibrovascular stroma - this is fibrous tissue that gives form to the glands containing the capillaries supplying them with blood. Under the microscope it can be seen that the parenchymal cells (the specialised cells) are arranged in thick branching cords throughout the stroma (the adipose and vascular tissue). Sheet and tubular formations are also seen.